Albury Conservation Company has once again teamed up with ‘Edge Pledge‘ to raise funds to help conserve the Squirrel Glider population under threat in Thurgoona / Wirlinga, the urban growth corridor of Albury, NSW. Our 2017 campaign (which kicked-off on 12th August) has so far raised $3,409 raised by 8 ‘Extinction Fighters’, via 72 generous donors. Amazing effort!! Funds raised so far are enough to purchase 12 motion-sensing wildlife cameras to be used in our Squirrel Glider monitoring program kicking off in Autumn 2018. We are so excited and grateful for the support shown so far! CAN YOU PLEASE HELP US REACH OUR TARGET of 25 motion-sensing wildlife cameras? To find out more about what the funds raised in 2017 will be used for by Albury Conservation Company click here. We’ve all heard that saying “you don’t know what you’ve got until it’s gone“. It usually relates to a lover who was taken for granted and got up and left, never to return. Well, it’s a sad, sorry phrase that we DON’T EVER, EVER want used when talking about Squirrel Gliders in Thurgoona! But how do we know what we’ve got? Squirrel Gliders are an elusive animal – they live their lives almost entirely in trees – sleeping in tree hollows (and nest boxes) during the day, and gliding from tree to tree at night searching for food and other necessities of life. We live opposite lives. That’s where scientific MONITORING comes in. We’ve developed a plan that involves motion-sensing wildlife cameras that can take images in the night, set-up at strategic locations around Thurgoona / Wirlinga by an expert ecologist ably supported by keen community members – school kids, land owners, mums and dads, Edge Pledge donors, anyone! These cameras will be up for two weeks per year – in Autumn and Spring – and the plan is to repeat these surveys for many years to come. Only then will we be able to say whether the population is stable, increasing, or most importantly dropping – to enable the community to act before it’s too late. 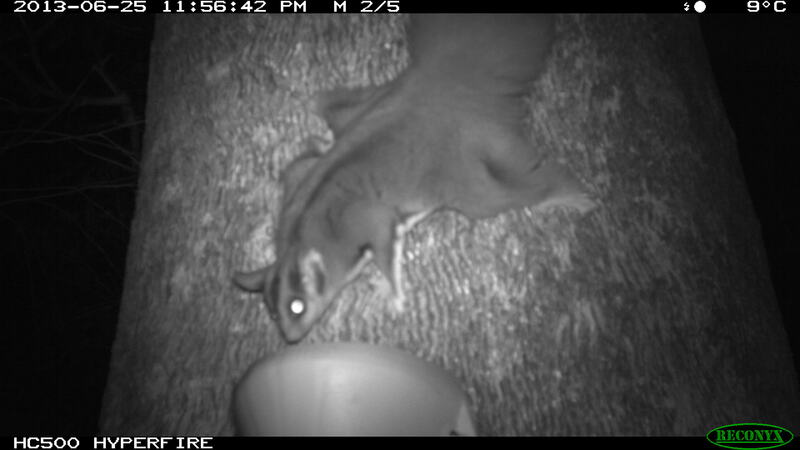 Squirrel Glider feeding at night in Thurgoona captured using a motion- sensing wildlife camera (2013). This is our second year involved in Edge Pledge. In fact, we were one of only 11 environmental organisations nationally to partner Edge Pledge last year in its inaugural year. In 2016, we received $3,853 raised by 7 extinction fighters from 97 donations. The money raised has purchased 42 Squirrel Glider nest boxes, built by Thurgoona Men’s Shed and installed by Albury City Council in August and September 2017 along local roadsides lacking in hollow-bearing trees and existing nest boxes. Expert design, high quality construction, and strategic placement of the nest boxes will help ensure that Squirrel Gliders will find and use them in a relatively short period of time. 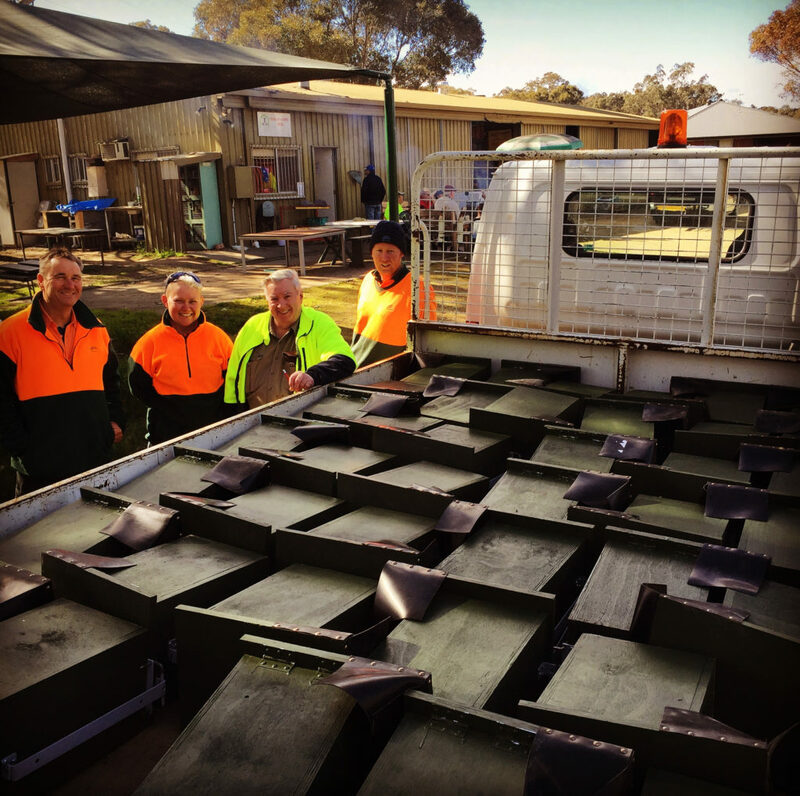 42 nest boxes built by Thurgoona Men’s Shed with Edge Pledge donations in 2016, are now ready for installation across Thurgoona by Albury City Council (August 2017). 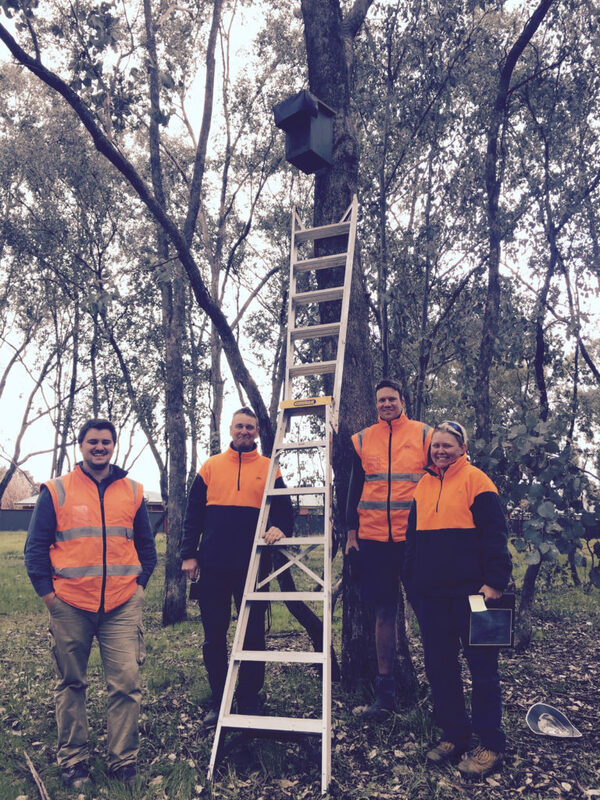 Albury City Council staff (L to R – Matthew, Peter, Brendan, Louise) installing ‘Edge Pledge’ nest boxes for Squirrel Gliders in Thurgoona. 42 nest boxes were built by Thurgoona Men’s Shed with funds donated to Albury Conservation Company’s 2016 Edge Pledge campaign (14th Sept 2017). 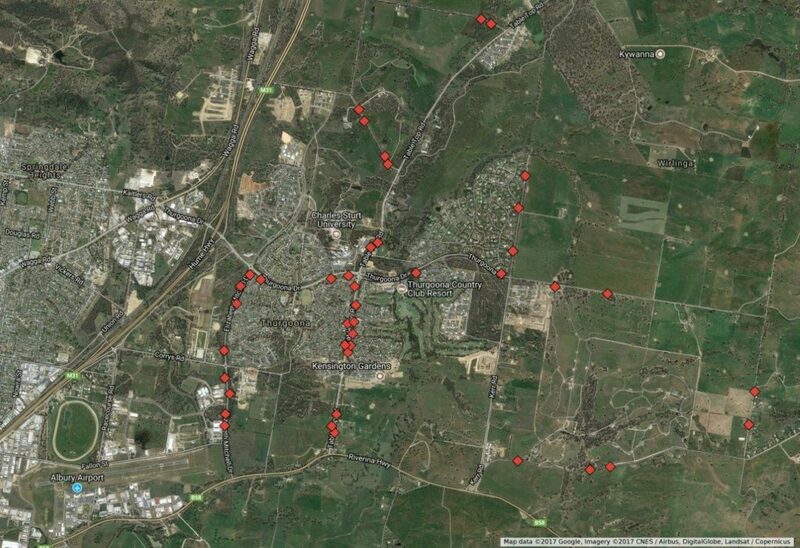 Locations of Squirrel Glider nest boxes built by Thurgoona Men’s Shed, purchased by Albury Conservation Company using ‘Edge Pledge’ 2016 campaign funds, and installed by Albury City Council (Sept 2017). Sam Niedra – Write, record, and make public one song per week for three weeks. Nigel Jones – Sleep up a gum tree in Thurgoona. Damian Michael – Walk on hands for 60 metres (the maximum distance Squirrel Gliders are able to glide between trees). Ebony Allen-Ankins – Quit coffee for 3 months. Sera Blair – Spend one night on a platform up a Mountain Ash Tree. Joseph Thomsen – Wear an outrageous sandwich board while dressed as a Squirrel Glider.